If you’ve got trees, you’ve got leaves. And if you’ve got a gas blower, life gets easier. Blower tube. Directs airflow toward your debris. Nozzle. Concentrates the air stream for more precise blowing. On/Off Switch. Switch to On when you’re ready to start. Off to stop. Throttle control. Keeps the engine running—and air moving. Cruise control. Provides a steady air stream without having to hold down the throttle. Handle. Hold here with your right hand. Spark plug. Ignites fuel to turn it into trimming power. Muffler. Cuts down on engine noise. Starter rope grip. For pull-starting the engine. Air filter cover. Keeps the air filter in place, which keeps your blower running better. Choke lever. Helps get your engine going. Primer bulb. Gets fuel into the carburetor for easier starting. Fuel cap. Mixed fuel goes here. Step 1: Before starting, fill the tank with the right mixture of gasoline and oil. Check your manual to get the recipe right. 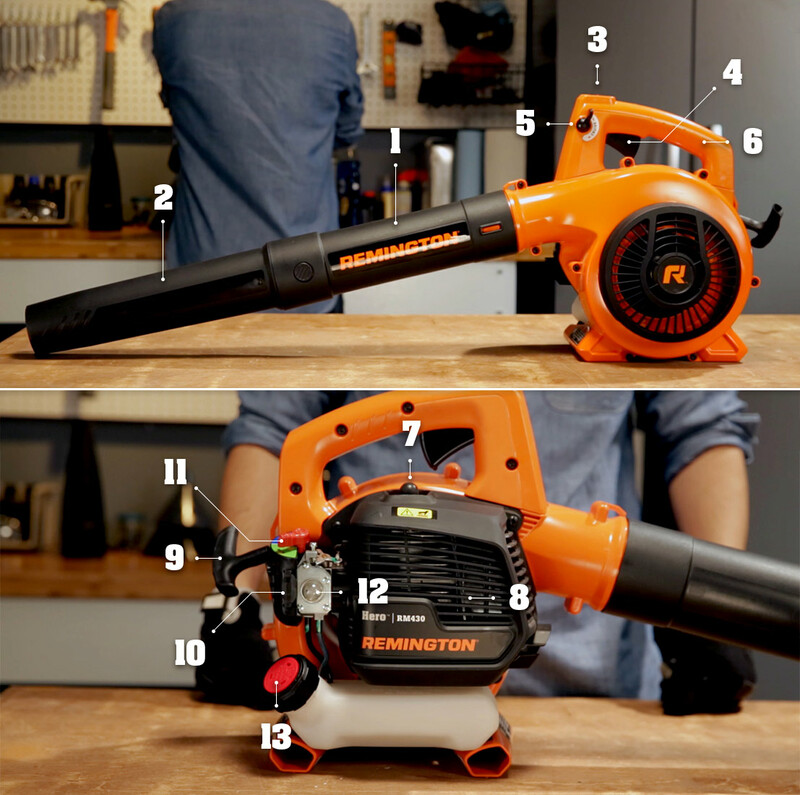 Step 2: Set your blower on the ground and move the cruise control to SLOW position. Don’t squeeze the throttle control yet. Step 3: Fully press and release the primer bulb 10 times to get fuel into the carburetor. Step 4: Next, flip the lever clockwise until it clicks into the START position. Pull the starter rope until the engine starts, slow and steady. Give the engine 5 to 10 seconds to idle. If it stalls, or doesn’t start after 10 pulls, prime again and pull. Repeat until it starts. Step 5: Squeeze and hold the throttle so the engine can warm up, 30 seconds to a minute ought to do it. You’ll know it’s ready when it accelerates without hesitation. Step 1: Release the throttle or move the cruise control back to the SLOW position. Step 2: Press and hold the On/Off switch in the off position until the engine comes to a complete stop. Step 3: Store blower in a cool, dry place. Read on for more tips on mastering your gas blower. Learn how to safely wrangle any debris that comes your way.